In 1986, the Commodore 64 got its own graphical user interface system, capable of running only on 64 Kilobytes RAM and a 170kb floppy drive. 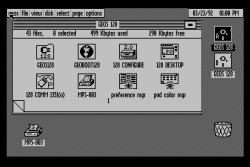 GEOS, the Graphical Environment Operating System, was like having Windows on an 8-bit computer. At that time, the venerable machine had already been on the market for about four years and was starting to get overshadowed by its 16-bit successors like the Amiga – but the computer was still popular, because it was now very inexpensive and lots of games and software were still being released for it. There were many good serious programs, but most of them limited themselves to the C64’s text mode and only few graphical interfaces like Commodore’s own MagicDesk had emerged. But this was all about to change in 1986 and it was all the fault of the airline industry. In the mid-1980s, a small software house called Berkeley Softworks, led by Brian Dougherty, was developing the user interface for a small, 6502-based LCD computer that could fit into the trays of airliner seats. But then disaster struck in the form of airline regulations, which forced the companies to operate more cost-effective and among the first things to be axed were luxurities like the Sky Tray. Berkeley Softworks found itself with a more than half-finished product that nobody wanted anymore, but Dougherty and his band of programmers were not about to give up and began looking for other ways to implement the Sky Tray system. They found the Commodore 64, which used the same microprocessor as the Sky Tray, and began to adapt their software to the still powerful computer. In 1985, the first version of GEOS was released and it immediately began to get noticed as something special that breathed new life into the C64 as a serious computer and not just a game console with a keyboard. Even in the early incarnations, the similarities to the Amiga Workbench, Atari’s GEM and even Apple’s MacOS were undenieable, but it ran on a small, 8-bit machine that only cost a fraction of its larger cousins. GEOS was not a game, but a powerful productivity system turning the C64 into a small, but affordable office computer. The real breakthrough came when Commodore decided to bundle a two-sided, one-disc version of GEOS 1.3 with the redesigned C64C, making it instantly popular by bringing it to every machine sold – a clever marketing ploy that helped both Commodore and Berkeley Softworks, who were still busy even further developing their system. 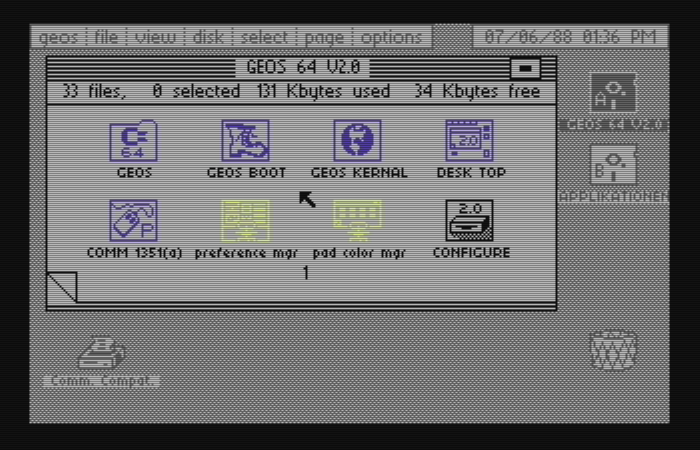 When GEOS 2.0 was released in 1988, it was already pretty well known, but the upgrade was worth it because it made the system faster and more flexible. 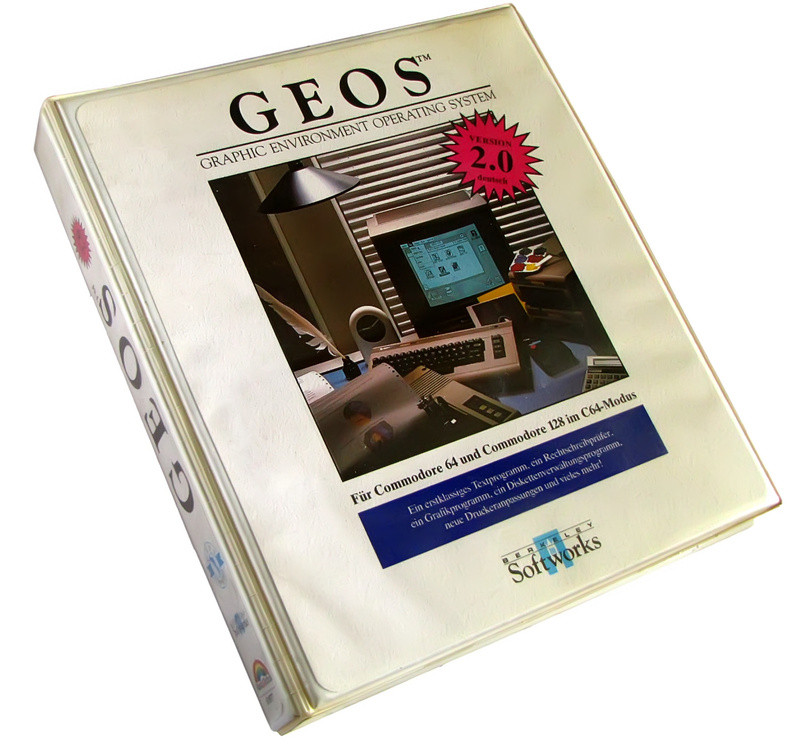 The standard GEOS package came only with two major programs, geoWrite and geoPaint, but those had amazing features for programs running on such limited hardware. It was possible to run GEOS on an unexpanded C64 with only one , but although the system used a software floppy speeder, there was only so much data you could squeeze through the serial bus, into the 64 kilobytes of RAM and on to the 170 kilobytes on each disk side, making floppy disk changing often necessary. Certain system components like the desktop and the preferences needed to be on each disk, but since it was possible to make multiple copies of the main programs, so that creating work disks for separate purposes was not a problem. This was why GEOS supported expansions of the C64 as much as possible – if you had two floppy drives, the system was very easy to work with. The bigger the drive space, the more comfortable GEOS became – if you had a 1571, you could use both sides of the 5.25” disks at once, doubling the space to 340 kb and the rare 1581 3.5” drive was almost like a harddrive with its mind-boggling 800 kb per disk. Another indespensable device was a RAM expansion, which helped enormeously to speed things up and provided a virtual RAM disk. GEOS also supported several input devices, with the standard joystick perhaps the most common method to move the pointer – but it also supported the Commodore 1351 Mouse, which was practically identical to the one that came with the Amiga and made GEOS a fully featured graphical user interface. Other devices like the popular Koala Pad graphics tablet were also supported. Berkeley Softworks pushed the C64 to its limits and used every trick imaginable to make GEOS as powerful as possible. 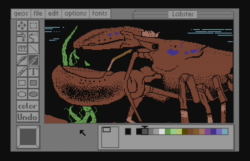 Instead of the limited 160×200 graphics mode, the full 320×200 pixels were utilized, even with the full 16-colour palette. There was, of course, no real multitasking because of the slow processor and the small RAM, but the speed was still tolerable even on a standard C64 and programs did not take long to load – the worst waiting time on an unexpanded system was maybe twenty seconds, pretty impressive for a computer whose long game loading times had become somewhat of a joke. 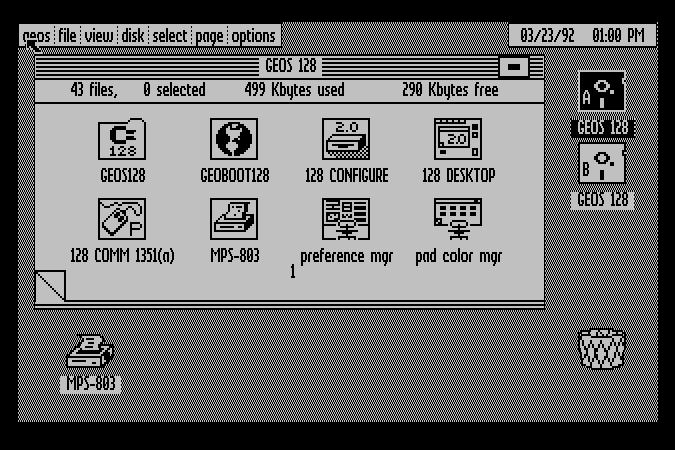 The heart of GEOS was the Desktop, which was basically the program manager and file browser of the system. The contents of up to three drives could be displayed as icons and although the Commodore drives except the 1581 did not support subdirectories, it was possible to group and sort the programs and data files into ten different pages on each disk. The desktop colours were fully customizeable, even the colours of the screen elements were freely selectable from the palette of 16. GEOS recognized 18 different file types and while the icons could only be drawn with a singe colour, it was up to the user which one it would be. Drag and drop was standard, there was an area below the program screen to place icons for moving onto other virtual pages. There was even a trashcan to delete files with an undo feature – it had every trait of a modern GUI, all running on the Commodore 64. GEOS 2.0 already came with a full set of programs which amounted to a small Office package. The two main programs were geoWrite and geoPaint, accompanied with several utilities like a serial letter program, a spell checker and other useful software. In Germany, a translated version of GEOS was sold by the Commodore specialists of the Markt & Technik Verlag in a package containing four double-sided disks and an enormously detailed 300-page handbook. The price of the standard GEOS 2.0 was just 89 DM, about the same as a new game release and certainly not too expensive. Several other major third-party additions were available separately for 89 DM each like the spreadsheet GeoCalc, the database GeoFile and later even the DTP program geoPublish. geoWrite was the first and maybe only word processor which truly adhered to the WYSIWYG principle – What You See Is What You Get, something that was entirely uncommon in 1980s text processing programs. Most word processors were extremely powerful, but only used codes on screen to control what the printer was doing to the text output. 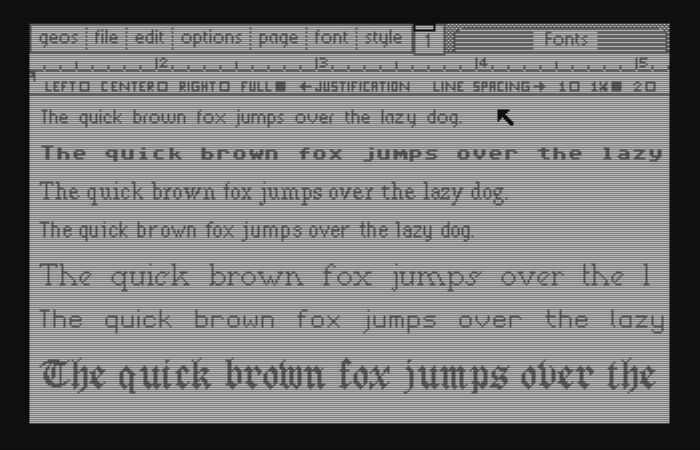 Proportional fonts were a rarity and while some programs had preview features, directly editing the graphical output was unheard of. GeoWrite did all this and while the features were basic compared to today’s word processors, they were nothing short of astonishing back in the late 1980s. Most astonishing was the inclusion of several good-quality fonts, which were bitmapped, but available in several sizes and looked amazingly good on screen as well as printed. 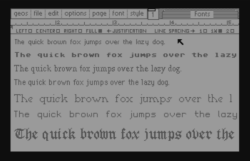 All fonts could be rendered in bold, italics, contour, underlined and super- and subscript. There was a clipboard available and copying, cutting and pasting text was possible. Although there were no scrollbars, a tiny overview indicator at the top of the screen was provided. Spell checking and bulk letters were not built in, but available with the external geoSpell and geoMerge which also came with the standard GEOS package. geoPaint was basically a clone of MacPaint, which had been released together with the first Apple Macintosh. The features were almost identical with almost all of the tools replicated and while geoPaint only used a 320×200 screen resolution as opposed to the Macintosh’s 512×342, it had the VIC-II’s 16 colours available instead of just being monochrome – albeit with some slight limitations due to the C64’s hardware. The painting area was not limited to the screen, but to a printer page, emphasizing the goal of GEOS as a publishing platform. The Tools included everything a respectable painting program had at the time, including a pencil, paint brush, air brush, line, rectangle and circle/ellipse drawing, flood fill and a text tool. The paint and air brushes were able to paint in 16 colours and also in 32 predefined, built-in patterns. A selection tool for moving, duplicating, mirroring, inverting, rotating and even resizing image parts was also available and zooming into a special ‘pixel mode’ was possible too. What looked a bit like a toy on the outside was actually a very powerful graphics program capable of many tasks usually reserved for much bigger computers than the C64. 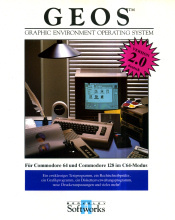 GEOS also came with a multitude of other smaller tools like an alarm clock, a notepad, a photo manager and several other utilities – and this wasn’t the end of it by a long shot, because once the system had gained popularity, many other programs appeared for it and at the end of the 1980s the C64 and C128 software selection was positively dominated by programs running exclusively under GEOS. 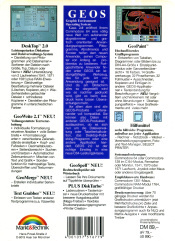 Markt & Technik released two Mega Packs for GEOS as ‘Bookware’ in Germany, so called because they each consisted of roughly a megabyte of data on two floppy disks with fonts, cliparts and some utilities. Even some GEOS games were made, although those were limited to mostly static graphics because the system was already busy drawing the graphical user interface. In the early 1990s, the programs published by the German 64’er Magazin gravitated more and more towards GEOS, especially when the magazine switched to a disk-based distribution instead of printing program listings. When GEOS 2.0 was introduced, Berkeley Softworks had also also introduced a separate version for the Commodore 128, which was able to use the double amount of RAM and in addition to the 320×200 colour screen, the 640×200 high-resolution monochrome mode of the C64’s big brother. Running at roughly 2 MHz CPU speed in highres mode, GEOS 128 was surprisingly fast and responsive and the better resolution made especially geoWrite 128 even more useful. 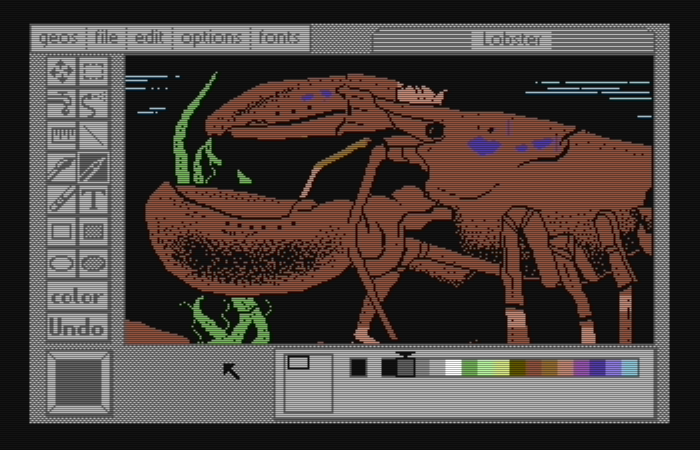 Also, geoPaint 128 became a more serious MacPaint competitor even though it was reduced to monochrome 1-bit graphics. 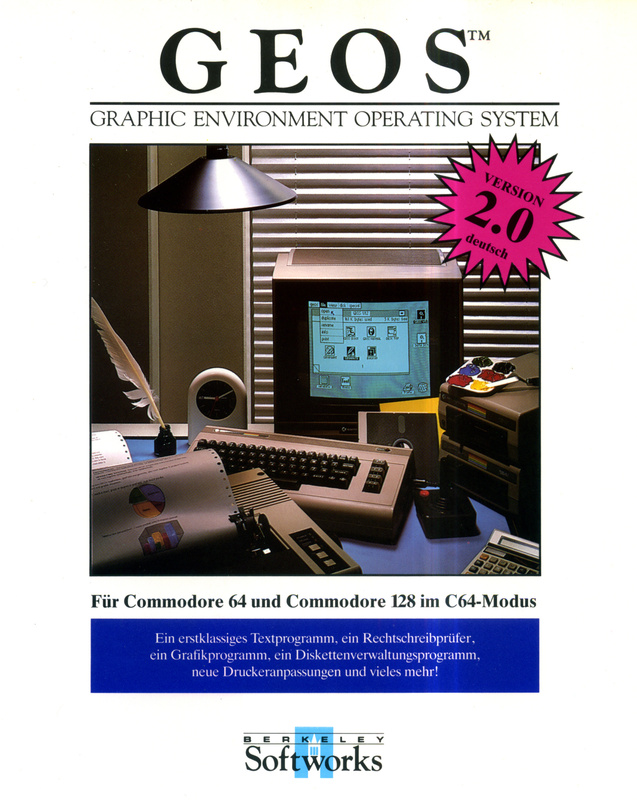 Many of the standard GEOS programs were released in separate C128 versions capable of running in high-resolution mode – unfortunately one of the few exceptions was geoPublish, which would have benefited most from the C128’s enhanced graphics. GEOS 128 was, however, backwards compatible and able to run all programs written for GEOS 64. If GEOS had one failing, it was the copy protection, which was a real nusiance. Only the boot disks were copy protected, which you got two of, but they were so well protected that not even the best copy programs of the time were able to properly duplicate them. You were allowed and encouraged to make copies of the application disks, but these were keyed to your boot disks with a hidden serial number so mixing several different sets of disks was not possible. Fortunately the boot disk did not have to remain in the drive when GEOS was running, using a copy with the system files on it was possible. Those limitations wre, however, a small price to pay for what GEOS had to offer. Only recently transferred disk sets with patched GEOS versions that do not suffer from these problems have emerged, which can now be used on emulators or even on the real computers. After GEOS 2.0, there were several improvements and addons, although it was really the last version done by Berkeley Softworks themselves. 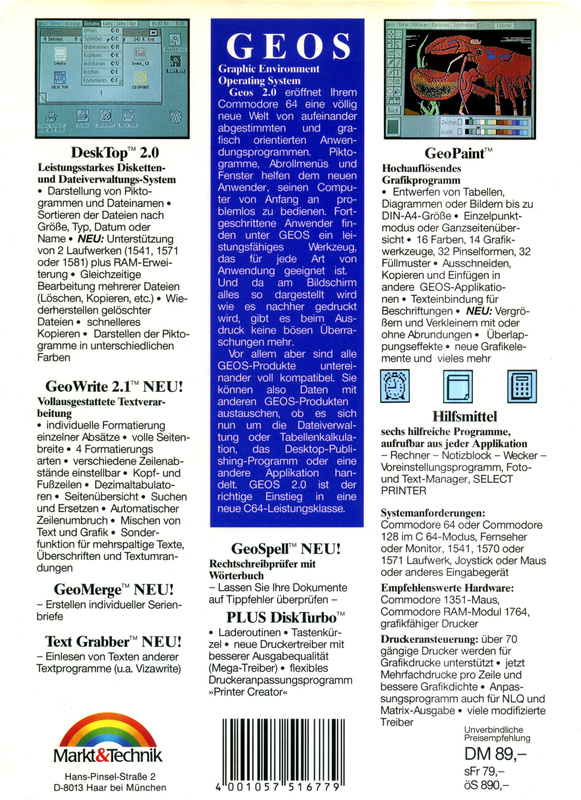 There was a 2.5 release only in Germany which included the TopDesk Desktop replacement and some other improvements, while another came from the Commodore hardware manufacturer CMD, who renamed it to GateWay and made it compatible to their harddrives.. Later Maurice Randall released his own upgrade called Wheels, but all of these needed at least RAM expansions and other additional hardware to run properly. Berkeley Softworks later migrated their software development to the PC platform and released the office suite geoWorks, which did not resemble the 8-bit versions at all and was meant to compete with Windows on low-end computers – but it never had the success GEOS had on the Commodore computers. GEOS gave the Commodore 64 and 128 a whole new life well into the early 1990s when it was competing against the Amiga, Atari and even the IBM-PC. With GEOS, the last 8-bit Commodore computers were still useful not only as gaming machines, but also as semi-professional office computers. Today, GEOS for the C64 or C128 is still a fascinating environment that shows what those old machines were capable of. There are many sites you can get GEOS 64 and 128 nowadays for emulators and real systems, but the best collections are ShadowM’s Commodore Page and Click Here Software – both are offering the GEOS disk images legally and also contain some of the later versions. Note: the screenshots were created with the VICE emulator, since I have some video connection problems with my C128D at the moment and I can’t grab frames from the high-resolution RGB output. The photo of the manual and the front and rear cover are from my own German edition of GEOS 2.0.